The Diagnostic Pedal “Quadspect” has been designed to stress-test the frontal femoral musculature (Musculus quadriceps) inside a MR bore. 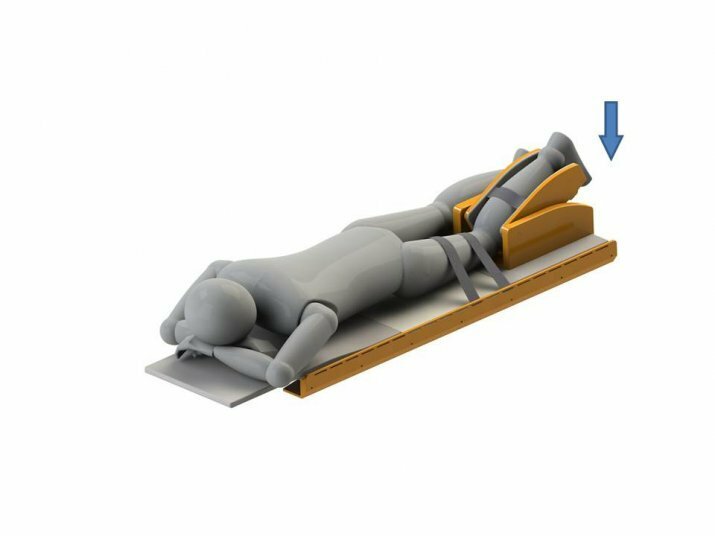 The subject is therefore placed in prone position and fixed with adjustable straps performing a knee extension against the resistance of the device. Resistance is generated by air pressure and can be controlled precisely and changed during the measurement. This allows the muscle to be investigated during a predefined load protocol in connection with advanced MR-techniques. This module will be delivered with a maximum standard torque of 110 Nm or with an optional upgrade to 250 Nm for sport-related medical examinations. In addition to questions related to metabolic disease and peripheral arterial disease, the Diagnostic Pedal “Quadspect” has already been successfully used in conjunction with questions relating to sports medicine. When this muscle section is exercised, the whole body is challenged and if high loads are applied, the body works at its physical limit. This systemic stress facilitates the assessment of the whole-body training status during the MR measurement. Thus, very diverse diagnostic areas and applications are possible with the Quadspect pedal. The Diagnostic Pedal “Quadspect” was designed as a user-friendly device for routine clinical examinations. The approximate setup time is less than 5 minutes. The pedal platform with our unique exchange system for all muscular modules permits the test subject to be positioned comfortably and securely. The ergonomically designed pedal allows the examined leg to undergo a physiological knee extension. Parameters assessed include force, frequency, work output and distance. The adjustment of the load is fully automated via a computer-assisted feedback-mechanism.